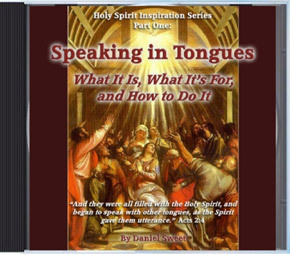 Home / Holy Spirit / What is Speaking in Tongues? So they got holy spirit and immediately they all spoke in tongues. Not just some of them. All of them. Every born again Christian is given the whole gift of holy spirit. One of the manifestations of the spirit is Speaking in Tongues. This manifestation is available to every born again Christian… including you! Speaking in tongues is a brand new thing that God did for the Church. You can read the Old Testament from Genesis 1 to Malachi 4 and you will not find anyone speaking in tongues. You can read the four Gospels and you will not find anyone speaking in tongues. The first time anyone spoke in tongues was on the Day of Pentecost in Acts chapter two, at the birth of the Church. So tongues is something that God did for the Church. Speaking in Tongues was something new, something very special. To speak in tongues is to fluently speak a language of either men or angels, a language that does not come from your mind, but by way of God’s spirit within you. It is primarily designed for one’s internal use, but it is also to be utilized in a gathering of Christians by following it with its companion manifestation, interpretation of tongues, so that the Church is edified by one’s praise to God (1 Cor. 14:5). Yup. And you know what? You’re going to nail it the first time. You can’t possibly do it wrong because it is the holy spirit inside you giving you utterance. Guiding you in what you say. Does that require any faith, any trust in God, Jesus Christ, and the Word? It sure does, and isn’t that what being a Christian is all about? It always comes down to whether or not we really believe what God says. That’s true believing in action. The Apostle Paul says, “I would like for you [each Christian] to speak in tongues” (1 Cor. 14:5). Because speaking in tongues is a beautiful way to get around the limited vocabulary of our native language and tell our Father that we love Him. – Build yourself up in faith (Jude 20). Acts 10:46 “For they heard them speaking in tongues and praising God…” Amen. We read in 1 Corinthians 14:16-17 that speaking in tongues is again stated as praising God. That brings up the next point, which is that speaking in tongues is giving thanks well. (16) If you are praising God with your spirit, how can one who finds himself among those who do not understand say “Amen” to your thanksgiving, since he does not know what you are saying? (17) You may be giving thanks well enough, but the other man is not edified. Sure, chances are you speak the language that the people in the congregation speak – like in my home fellowship I speak English and everybody who comes speaks English, and so when we speak in tongues, since we don’t understand it, nobody else does. Pretty simple! Verse seventeen – you may be giving thanks well enough. So speaking in tongues is praising God. Speaking in tongues is giving thanks well. A lot of times people wrestle with prayer. What should I pray for? We can pray by speaking in tongues. Because it’s prayer in the spirit. And I’ll tell you something else, it edifies the one who is speaking. 1 Corinthians 14:4 “He who speaks in a tongue edifies himself…” Now the word edify is ‘to build up.’ And there’s a lot of different ways that speaking in tongues can build you up. It can remind you of your salvation, and that your situation spiritually is secure. It can calm your mind, if your mind is racing. Speaking in tongues can give you peace at times when you just don’t seem to have any peace. And speaking in tongues builds you up in the spirit, not that we understand this perfectly, because we don’t. I just know that Scripture says that it builds us up. Believing Scripture to be true, I believe that speaking in tongues builds people up. I know this because when I run into people who speak in tongues a lot, they are generally more spiritually in tune than those who don’t. And so another thing here is that speaking in tongues is under your control. Because you can speak in tongues when you want to, stop when you want to – God is going to tell you that there are certain things that are decorous, are proper, and are respectful when it comes to speaking in tongues. I think we’ve all heard the horror stories about the stranger who goes into a Church where everyone is shouting in tongues, and they become scared and afraid, and Scripture tells us that. So when we speak in tongues we do it in a way that’s a blessing, and we interpret so it blesses the people. It’s proof that we’re born again. God says He wants us to. It speaks God’s wonderful works. We should be pushing ourselves to speak in tongues a lot. All Christians can speak in tongues (via the gift of God’s holy spirit), whether or not you choose to do it is your choice. The Apostle Paul seems pretty convinced that you would benefit from it, so get started speaking in tongues today!